Holiday Season: December 21 – January 8, Every Day for dining & lodging (2-N min may apply)...Family Friendly Period! 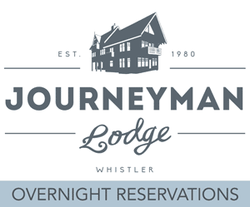 Journeyman Lodge was built on sweat equity and a belief in the inherent value of exploring the natural world. As our lives and culture continue to accelerate, the need to slow down, unplug, and reconnect is more important than ever. Whether you’re looking for a quiet weekend escape or a snow-blasted trip of adventure, Journeyman Lodge has an authentic winter backcountry package waiting for you. While all of our inclusive lodging packages provide prepared meals and luggage transfer service, we’ve designed a a few variations to meet unique access needs and schedules. Additional services such as gear rentals, return snowmobile transfers, lunch on arrival, and trip guides can also be added to any package on request. 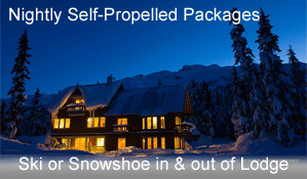 Our Nightly Self-Propelled Package is an independent ski-in / ski-out (or snowshoe-in / snowshoe-out) trip. Click Here>> to learn more about the self-propelled adventure into Journeyman Lodge. These Packages INCLUDE accommodation; all meals (après-ski appetizers and a 3-course dinner, with a continental breakfast and bagged lunch for each night booked; coffee, tea, milk, juice & hot chocolate – please note we do not serve alcoholic or soda beverages but you are welcome to bring your own); a return luggage transfer (1:00pm from base to lodge; 10:30am from lodge back to base), and the use of our lodge snowshoes, toboggans, and the Traditional Scandinavian sauna. *These prices DO NOT INCLUDE Ski Callaghan Admission, liquor service, taxes, or gratuities. Please be advised that advertised prices are based on double occupancy. Private rooms are subject to a 15% single supplement that are included in online quotes. FAMILY FRIENDLY DAYS (for families with children 13 & under): Dec.21-Jan.8, Feb.15-19! please note that children ages 3 & up will be charged at regular guest rate. Whether you plan on heading deep into the backcountry for a self-guided ski touring adventure or you’re looking for a quick getaway from the realities of work life…these Packages INCLUDE everything you’ll need to make it happen: a Friday evening transfer into the Lodge (5:30pm departure from base facilities/parking area); 1 to 2 nights accommodation; all meals (3-course dinner, Continental breakfast, and bagged lunch for each night booked coffee, tea, milk, juice & hot chocolate – please note we do not serve alcoholic or soda beverages but you are welcome to bring your own); Return luggage transfer (5:30pm from Callaghan Country base to the lodge; 10:00 – 11:00am from the lodge back to the base); and the use of our lodge snowshoes, toboggans, and the Traditional Scandinavian sauna. *These prices DO NOT INCLUDE Ski Callaghan Admission, liquor service, taxes, or gratuities. Please be advised that advertised prices are based on double occupancy. Private rooms are subject to a 15% single supplement that are included in online quotes. This package is exclusively designed for the early rising ski tourer wishing for 3 full days of powder explorations. *Please Note: While there is an early start in this package, rooms are not available until later in the day and skiers are required to be prepared to depart for a full day of skiing on arrival at the lodge. This package is not available for XC skiers or snowshoers. These Packages INCLUDE a Sunday morning transfer into the Lodge (8:30am departure from base facilities/parking area); 2 nights' accommodation; all meals (packed lunch ready for you to pick up at lodge on arrival, followed by après-ski appetizers and a 3-course dinner on Sunday evening, Continental breakfast, bagged lunch, après-ski appetizers and a 3-course dinner on Monday, along with a continental breakfast and bagged lunch for your final ski touring day on Tuesday, coffee, tea, milk, juice & hot chocolate – please note we do not serve alcoholic or soda beverages but you are welcome to bring your own); Return luggage drop (8:30am from Callaghan Country base to the lodge; 10:30am from the lodge back to the base); Tuesday afternoon transfer back to base facilities/parking area (2:00pm departure from the lodge); and the use of our lodge snowshoes, toboggans, and the Traditional Scandinavian sauna. *These prices DO NOT INCLUDE Ski Callaghan Admission, liquor service, taxes, or gratuities. Please be advised that advertised prices are based on double occupancy. Private rooms are subject to a 15% single supplement that are included in online quotes. Designed for Sea to Sky locals with limited time, this package will maximize your ski/board time in the higher elevations with a morning boost to Journeyman Lodge and an afternoon mechanized exit on departure day. *Please Note: While there is an early start in this package, rooms are not available until later in the day and skiers are required to be prepared to depart for a full day of skiing on arrival at the lodge. This package is not available for XC skiers or snowshoers. These Packages INCLUDE a Monday morning transfer into the Lodge (8:30am departure from base facilities/parking area); 1 night's accommodation; all meals (après-ski appetizers and a 3-course dinner on Monday evening, along with a continental breakfast and bagged lunch for your second touring day on Tuesday, hot beverage service – please note we do not serve alcoholic or soda beverages but you are welcome to bring your own); Return luggage drop (8:30am from Callaghan Country base to the lodge; 10:30 from the lodge back to the base); Tuesday afternoon transfer back to base facilities/parking area (2:00pm departure from the lodge); and the use of our lodge snowshoes, toboggans, and the Traditional Scandinavian sauna. *These prices DO NOT INCLUDE Ski Callaghan Admission, liquor service, taxes, or gratuities. Please be advised that advertised prices are based on double occupancy. Private rooms are subject to a 15% single supplement that are included in online quotes. Gather your friends and prepare for 5 full days of self guided ski touring adventure. Available only to grps of 4-10 people, this is one of the best deals going. These Packages INCLUDE Snowcat transfer in and out of Lodge (10:00am departure from base facilities/parking area on arrival day / 3:00pm departure from lodge on departure day) 4-Nights accommodation; all meals (après-ski appetizers and a 3-course dinner, Continental breakfast, and bagged lunch for each night booked coffee, tea, milk, juice & hot chocolate – please note we do not serve alcoholic or soda beverages but you are welcome to bring your own); a return luggage transfer (1:00pm from base to lodge; 10:30am from lodge back to base), and the use of our lodge snowshoes, toboggans, and the Traditional Scandinavian sauna. *These prices DO NOT INCLUDE Ski Callaghan Admission, liquor service, taxes, or gratuities. *Ask us about upgrading to full lodge capacity with more guests or added value with an extended stay! $2000 for a fully catered & truly memorable corporate Christmas Party! Designed for corporate grps of up to 8 people. These Packages INCLUDE XC Rentals from Access Callaghan Ski Shop; Snowcat transfer to and from Callaghan Lake (only 4.5km XC ski to Lodge / 9:30am departure from base facilities/parking area on arrival day / 2:00pm departure from lake on departure day) 1-Nights accommodation; all meals Day of check-in: lunch, Après-ski appetizers and a 3-course dinner, Day of check-out: Continental breakfast and bagged lunch, Non-alcoholic beverages (coffee, tea, milk, juice & hot chocolate – please note we do not serve soda but you are welcome to bring your own); a return luggage transfer (1:00pm from base to lodge; 10:30am from lodge back to base), and the use of our lodge snowshoes, toboggans, and the Traditional Scandinavian sauna. *These prices DO NOT INCLUDE Ski Callaghan Admission, liquor service, taxes, or gratuities. Depending on the weather patterns associated with early season reservations, access may pose a bit of a challenge, but we approach it as a bit more of adventure, sometimes involving various types of vehicles to get our guests to the snow-line. 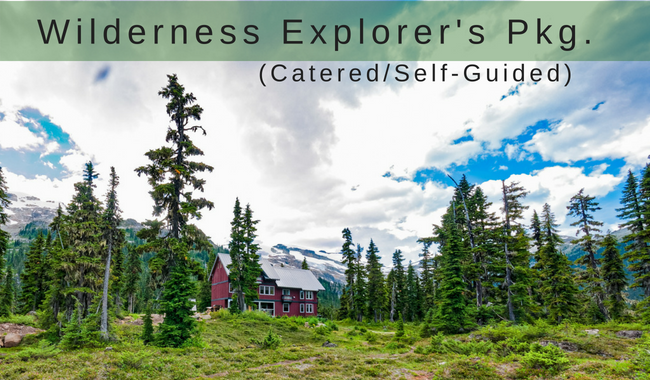 The Wilderness Explorer's package is an independent hike-in / hike-out trip from Callaghan Lake. Click here >> for a detailed Hiking map that includes a legend and route/trail notes. By day, trek and explore the spectacular surroundings of Callaghan Country. By night, enjoy a family style meal, chatting with fellow guests, the warmth of a log-fire, and a good night’s sleep. These Packages INCLUDE accommodation; all meals (afternoon tea service & a Backcountry BBQ dinner, with a continental breakfast & bagged lunch + hot & cold non-alcoholic beverages) for each night booked; plus the use of our Traditional Scandinavian sauna. *These prices DO NOT INCLUDE taxes, liquor service, gratuities, guest transport, or guide services. Please be advised that advertised prices are based on double occupancy. Private rooms are subject to a 15% single supplement that are included in online quotes.